The “Boxer Rebellion,” an anti-western uprising in China, was put down in 1900 by an international force of British, French, Russian, American, Japanese, and German troops. The Germans, however, forfeited any “prestige” they might have gained for their participation by arriving only after British and Japanese forces had taken Peking, the site of the fiercest fighting. 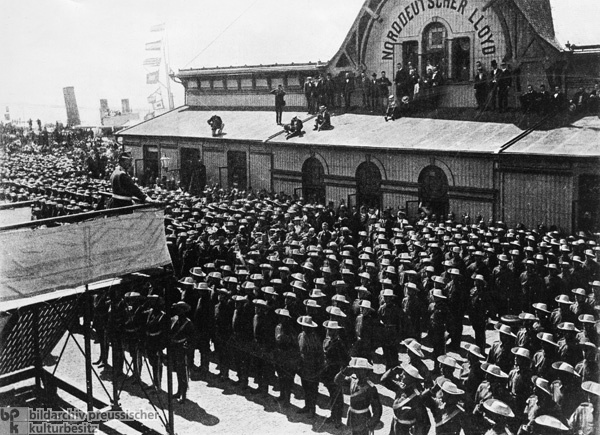 Moreover, the poor impression left by the German troops’ late arrival was made worse by the Kaiser’s ill-conceived farewell address (depicted here), in which he commanded them, in the spirit of the Huns, to be merciless in battle. Kaiser Wilhelm II’s public relations blunders, particularly in the field of international relations, were legendary. He was known for bombastic cant and grandstanding – although his words were often more threatening and aggressive than his actions. The term “Hun” later became the favored epithet of Allied anti-German war propaganda during World War I.